The Die Change Drive "Mark II" moves press dies onto press tables and down from press tables. The Mark II - System consists of 2 special rack and pinion which are guided within the T-Slots of the press table, as well as of hydraulic or pneumatic drives, which are installed in front of or within the press table. The T-slots within the press table, which are not occupied by rack and pinion, will be used for pneumatically operated Die Lifters with Rolls. To move the press die, the pneumatic operated Die Lifters with Rolls as well as both rack and pinion will be supplied with compressed air and thereby will lift the press die. The pressure of the rack and pinion against the bottom of the press die produces so much friction that the rack and pinion can move the press die into the press or out of the press on top of the also lifted pneumatically operated Die Lifters with Rolls. The Mark II- System also can be used multiaxially on Die Change Tables with T-shape. This means that the press die will be driven out of the press and then will be moved sidewards, or for example it will be moved from the side to the front of the press table and then will be moved onto the press table. 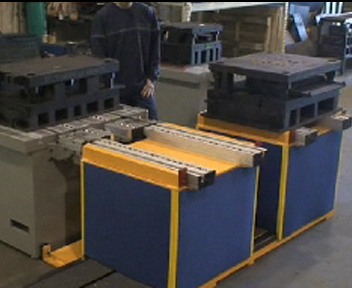 You would like to organize your die change fast, safe and for the operator ergonomically best possible? Then please contact us. We are prepared to consult you and we will establish for you an offer without obligation.